Over in the Ryder Division—some three years after claiming the Championship—Team California (2-0) is looking to stake its claim on yet another title. The team won in dramatic fashion at the 2015 PGA Jr. League Championship at Disney’s Palm Course in Lake Buena Vista, Florida, with a 35-foot birdie putt by Krando Nishiba on a playoff hole. The Championship continues with Sunday’s Day 2 of morning and afternoon divisional sessions. Monday morning will be the final session of divisional play. 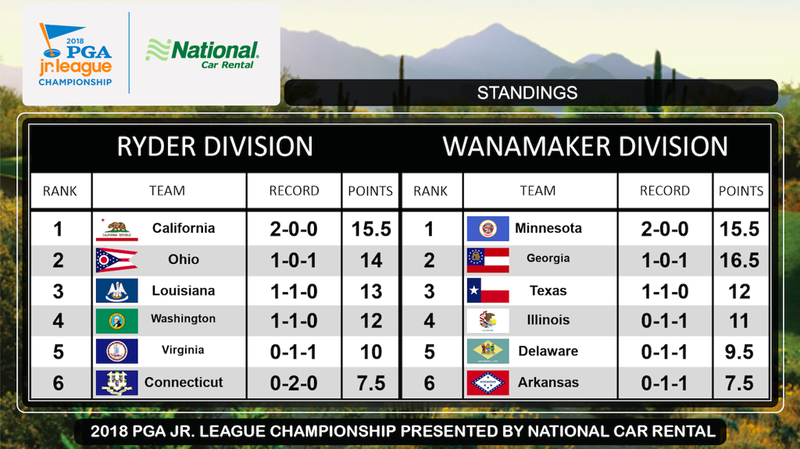 The top four teams will play in Monday afternoon’s Championship session, with the top two teams in each division playing for first and second place; and the two second place teams from each division playing for third and fourth place.